Anna: You have been waiting for this day all month, haven’t you Kirstin? Anna: When exactly did you stop cooking from these books again? Kirstin: I can’t even begin to think about it. Taking those expensive, heavy books down from the shelf made me feel sick. I kept searching for recipes with meat, but of course it was One Man and his Vegetable Patch. Anna: I wanted to like these books. They were my first Nigel books. But perhaps unfairly, due to my extreme work circumstances they were the wrong books for me this month. Kirstin: They were just the wrong books altogether, which is a shame because I’ve been raving to you about how wonderful Nigel is. But unless you have a garden full of vegetables and fruit, I would leave these books on the bookshop shelf. Anna: But a lot of people do have allotments. I preferred the vegetable book to be fair, it had more potential. The issue with book 2 was that most of the chapters were redundant for November because most of the fruit were out of season. 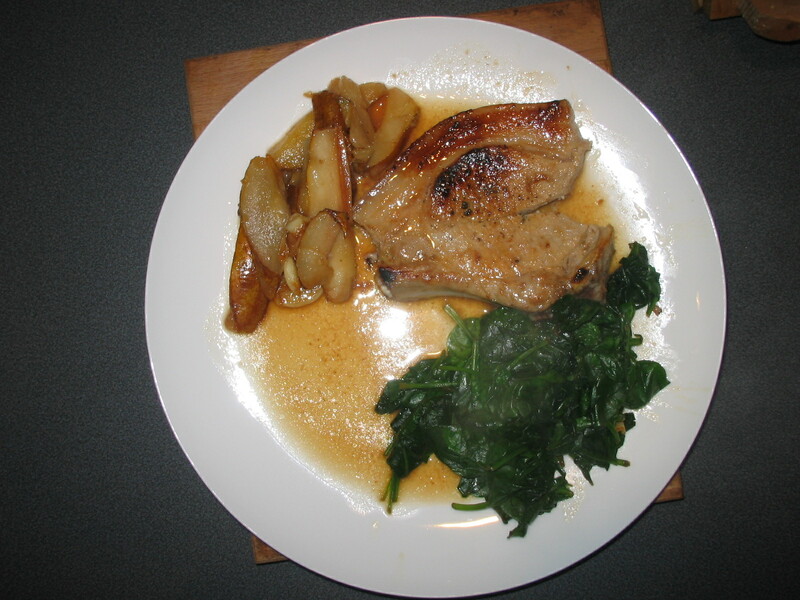 But I did like the pork chops with pears although there were no carbohydrates. Kirstin: But he has a whole chapter on potatoes, surely? Anna: Perhaps. I also liked the squid with chinese greens thing. Anna: Honestly, I don’t think so. I want to. But maybe when I have an allotment or I’m not working 56 hour weeks. Kirstin: He’s staying on the shelf for me. Sorry Nigel. I love all of your books except these two. Anna: What an appley feast! Peter: We’re certainly getting our fill. Are you working your way through this book chapter by chapter? Anna: No, but a lot of the fruit Nigel has chapters on aren’t in season. In fact most of them aren’t, so I’m stuck with apples. And blackberries. Plus, I needed dishes that I could cook in advance, over the weekend, to serve when your parents were here. Peter: Well you know I like a good sausage. This hotpot is all a bit beige though, isn’t it? It looks like something out of Oliver Twist. Anna: It’s not the most attractive dish to look at, no. And the beans haven’t cooked through properly. They’ve had two hours in total and they are still hard. Which technically isn’t Nigel’s fault. Peter: Think of the explosions we’re going to experience this week. Anna: Indeed. It tastes alright though. Peter: Yes, it’s nice. The apples were nicely assimilated. I wouldn’t call it a hotpot. But I would eat it again. Anna: It’s not the most exciting dish I have to say. It’s a bit like the goulash. Ok, but it’s highly unlikely I’m going to make it again. Sorry Nigel. Peter: The cake is lovely and moist though. I like this a lot. Anna: Yes, it’s turned out ok. I was worried when I was making it, as my crumble-topping didn’t crumble properly. I had to leave the bowl outside in the freezing temperatures for half an hour but to no avail. So it all melted into a sugary pastry instead. More like a cobbler. Peter: Well if you didn’t know any better you would never notice. I’m going to take it in my packed lunch this week. I think it’s the sort of cake that will get better as the week goes by. It’s definitely better cold. Anna: So I may make the cake again. But then again, I just don’t know if I can be bothered…..
Peter: I thought this dish tasted of Thailand. Anna: In a good way? Peter: Well, I don’t think there’s any bad Thai flavours. Anna: Unlike Nigel, we didn’t grow the choi sum in our garden. We foraged it at See Woo. Peter: I’m disappointed we didn’t get some frozen chicken feet while we were there. Anna: You helped with the chopping tonight which made preparing this very easy indeed. It’s proper quick too, once the greens have been blanched which adds a step I might not have otherwise taken. 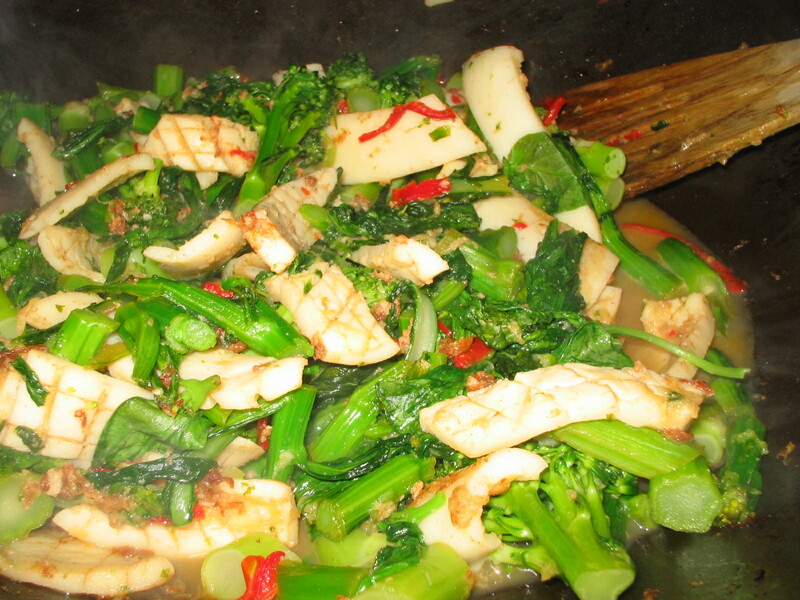 We didn’t have any rice because I thought the volume of greens and squid would be filling enough. Peter: I agree, it was fairly substantial in its own right. We put some extra tenderstem broccoli in as well so that helped. Anna: Would you like rice next time? Peter: You know, I think I can cope without. Anna: I may well add this to my squid recipe repetoire. As long as going to the local Chinese cash and carry features in that week’s shop. You win some, you lose some with Nigel……. 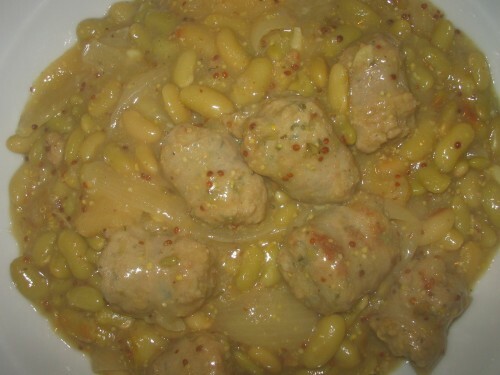 Anna: This recipe is everything you hate about Nigel Slater isn’t it? Peter: Um, not really true. I don’t know how much butter is in it. And it could benefit with some salt. At least it has carbs in it, unlike his other recipes! Anna: But it’s got a humungous lump of gorgonzola in it, and a tub of double cream. Peter: I’m happy with the cheese. The cheese I liked. But I could have done without the cream. When you’ve got a creamy cheese I don’t know why you would need more cream. Anna: To make it all amalgamate I guess. Peter: Well I liked it. Anna: I thought you would. Peter: There was a considerable amount of calories in it, but the next day when I burned off 3000 I didn’t have enough energy. Too many fat calories. Anna: After a late night at work the night before, and a 5.15am start that morning, it was the perfect comfort meal. Though a bit more fiddly to make then it potentially needed to be. Not the sort of thing I would EVER normally make, being as lardy as it was. But it was very yummy and hit the spot. Peter: I’d have it again, but is there a way of getting the fat content down? Anna: In for a penny, in for a pound my Love. If we’re doing this recipe the fat and calories are a given. 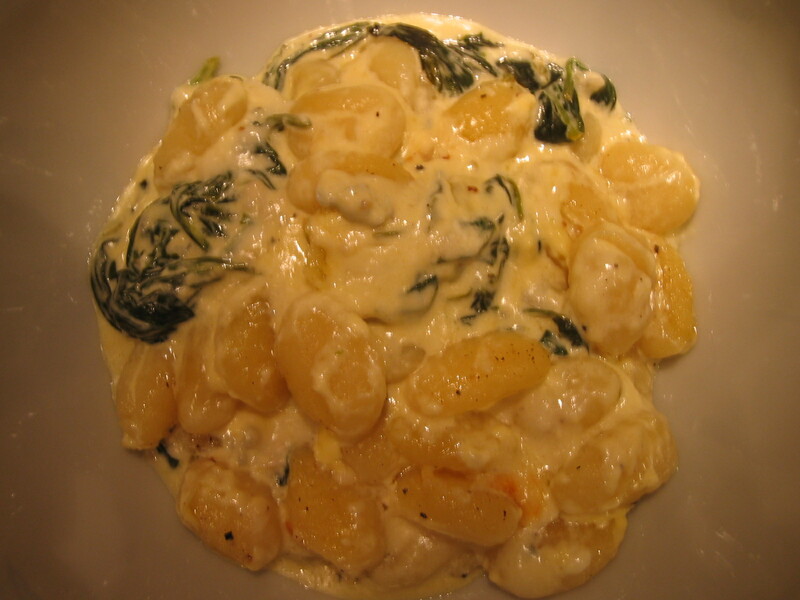 Peter: I think I prefer Gnocchi Surprise. Kirstin: I was quite excited about using Trappist beer in a recipe! Two bottles! But I failed on many levels. I didn’t have the right cut of beef, I had small onions, not large, and apple jelly — where does one find apple jelly? You make an apple sauce, but apple jelly needs to go in with the beef? I couldn’t find any. Tom: Well, I thought the apple sauce went rather well with the stew. Kirstin: It did, didn’t it? I wouldn’t normally go for that sort of thing. 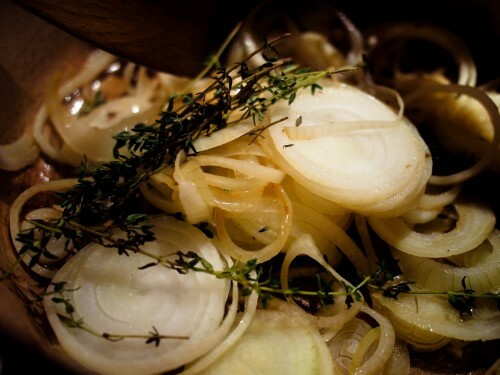 Anna: Nigel has vindicated himself tonight with this recipe. When I got home from work, the house smelled delicious! Peter: I had been busy with pork and pears, which has got to be Cockney rhyming slang for something. Anna: I was worried the pork chops would be all dried out, like the duck. But these were lovely and moist. And the combination of flavours with the pears was absolutely delicious. Really morish. Peter: We had thick pork chops so I thought they might need more time than he called for, which I did. It was pretty straightforward to make. It’s certainly a weekday supper. Anna: And you cooked it to perfection. I should let you cook more often. Peter: You might have to if you keep coming home from work this late. I’m not liking this Nigel diet though. The portions are too small and there’s no carbs. It doesn’t really feel like a meal. Anna: It was just the right amount for me but I know what you mean. We’ll have to bulk it out a bit for you next time. I’m very happy you were successful with this though. I loved it, and I know I can safely leave you in the kitchen to russle it up. Happy days. Anna: I was really looking forward to this. It’s the perfect November meal isn’t it? Peter: Yes, it’s certainly autumnal. The richness of the duck and the butternut squash. Anna: So I think that’s why I’m so disappointed. And frustrated. Peter: Nigel’s legs are certainly dry. Anna: Dry and tough. Difficult to eat. Peter: Just like Nigel’s legs! Anna: So an all-round annoyance really. Because I had to hack away at the legs to get any meat off, there was no savouring of the flavour combinations. I ate the duck leg. Then the sauce and the squash. Did you like the sauce? Peter: It was like a pudding, very nice. 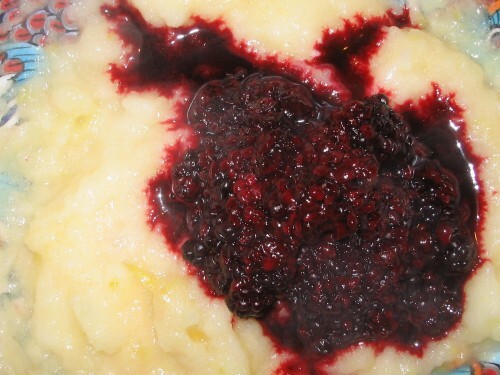 Particularly as it was made with our own blackberries and bramleys from the apple festival a couple of weeks ago. Anna: I was a bit thrown as I hadn’t read the recipe first, and the apples had to go in the oven to bake, but it was very easy and tasted delicious. Can’t tell you what it was like with the duck though. Peter: It provided a degree of moisture. Anna: I am very annoyed. Really. This was so simple to make and should have been much nicer. I’d recommend cooking the legs in the oven for 2 hours, a la Nigella, and add the squash for the last 45 minutes. 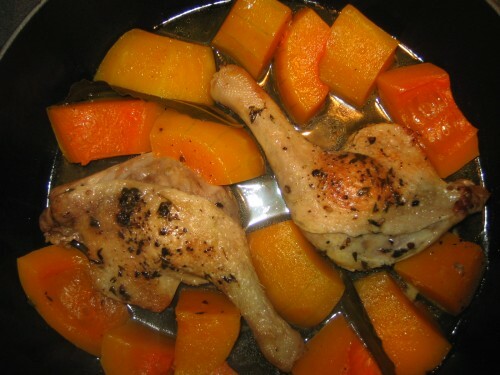 Then the legs would be all moist and lovely, and the squash roasted and brown. Much better.